2016 was an exciting and productive year for the Global Forest Coalition. We grew our membership to 86 NGOs and Indigenous Peoples Organisations from 58 countries, enabling us to reaffirm our unwavering defence of social justice and the rights of forest peoples. We grew and strengthened alliances and met the campaign goals and objectives that had been set out, and we recognised and responded to new challenges in the road ahead. 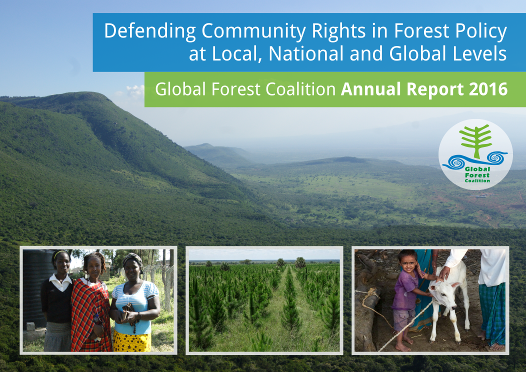 We are happy to share with you our 2016 Annual Report “Defending Community Rights in Forest Policy at local, national and global levels”. In it we reaffirm our belief in forest conservation by and for people, and the sustainable co-existence of forest ecosystems, Indigenous Peoples and local communities as paramount to protecting forests. These overarching principles have always been reflected in GFC’s campaigns, programmes and collaborations with allies. Reflecting on 2016, we draw renewed strength, determination and inspiration to fight even harder. Not only to defend, but also to propose, imagine, create and build new ways of relating to nature, forests, communities and each other. The defence of our forests is the defence of the roots of life, and in this struggle we will continue together, onward.